All hybrids have two electrical systems, low and high voltage. Low is 12v and high is whatever the HV battery happens to be; the important distinction is that they are kept separate from each other. 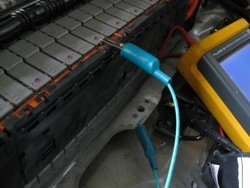 Yes, a DC:DC converter is used to charge the 12v from HV (previously the job of the alternator), and sometimes the HV can be “bootstrapped” or trickle charged by the 12v (Fords), but both of these tasks are accomplished through induction, so there is no electrical connection (only magnetic). The systems are kept separate for a critical reason: to keep high voltage under close watch and control. 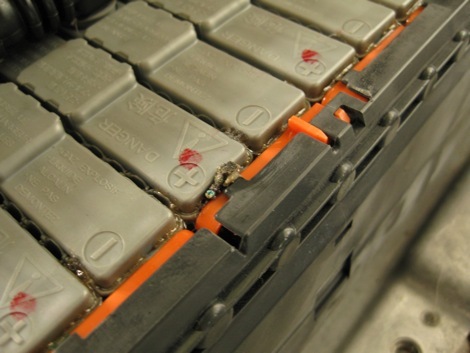 In the car, the 12v system is all around us; we wouldn’t want that with HV. Toyota hybrids constantly check high voltage isolation to confirm integrity of wire insulation, circuit insulation, and battery storage. If there is any HV reference to ground (low voltage), the car can detect it and warn the driver. One short to ground is ok; two shorts is a short of HV through the body (bad). When the car detects reference between HV and ground it sets trouble code P3009. The Japanese translation is poor; the Mastertech will read “High Voltage Leak Detective”. Again, this is not a fluid leak but continuity between high voltage and low voltage. Later models will add information subcodes within P3009 to help pinpoint the problem. The gen 2 Prius (and I expect other late models) will not restart (“ready on”) once a high voltage leak is stored. 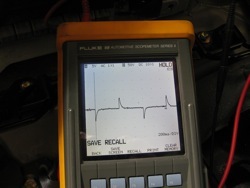 P3009 is common to gen 1 Prius transmission failures (read more on transmission failures here) when the coils of the electric motor short to the transaxle case or when insulation is otherwise degraded. The short can occur through the transmission fluid too, if it’s old and therefore become conductive, which is why changing the transmission fluid can sometimes help (even though the insulation on the motor windings is definitely deteriorated). But we at LG are now frequently seeing P3009 on gen 1s due to corrosion internal to the battery. This can be confirmed by clearing trouble codes and then waiting with the key on (ready off) to see if the fault resets. If so, then you know its happening within the battery assembly, since the system main relays (SMRs) are open when the ready light is off. 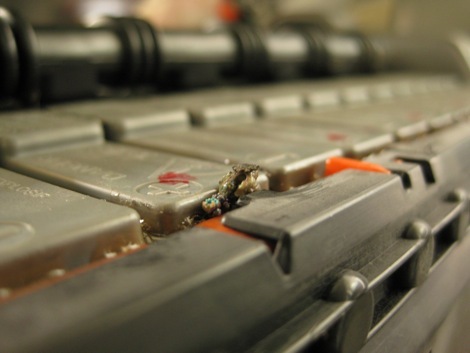 This is very important because battery corrosion can be cleaned off, even though the dealer will often insist on a whole new battery. At the bottom of this blog are some close up pics of the corrosion to show how it is reaching the battery cover. The flat side is where the mushroomed deposits have hit the top of the case and are therefore providing continuity. Anyway, I digress. Regardless of the HV reading, the car will have an A/C wave running over this value (see first pic) whenever the key is on (power to the Battery ECU). When there is a short to ground, the ECU’s ability to maintain this wave is reduced (see second pic, smaller wave amplitude). The more direct the short, the more the wave is depressed. I’ve seen direct shorts from plug-in conversions (where secondary HV batteries have had accidental contact to their cases) where the A/C wave was basically gone. 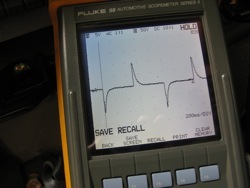 The car checks the performance of this wave, and when it gets too weak, it will set the P3009. 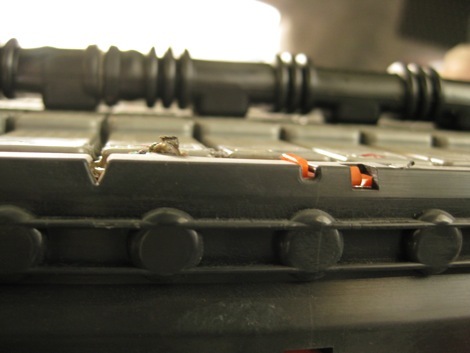 If it sets when the car is ready off, we will inspect the battery for corrosion, clean, and reassemble. We can verify the repair with an improved A/C reference wave. The car is fixed, of course, when the P3009 does not return. Note this is a lot less money than a new battery, which runs $2300-3000.